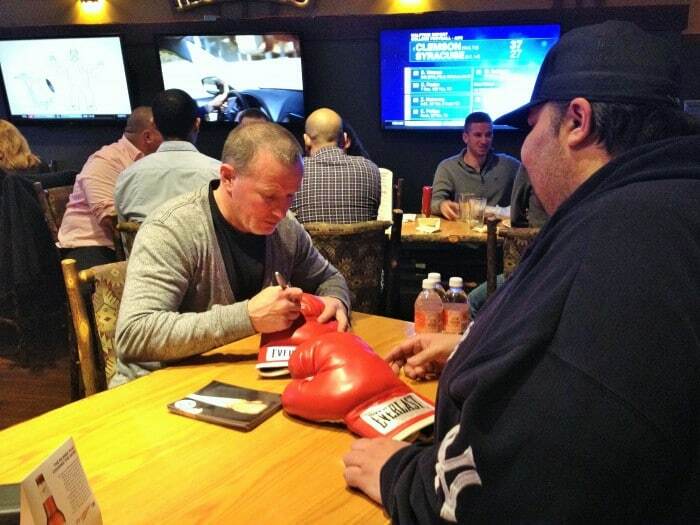 “Irish” Micky Ward (born October 4, 1965) is a retired junior welterweight professional boxer from Lowell, Massachusetts. Micky is regarded as a working class hero, a blue-collar athlete who has overcome many difficulties in life and prevailed through determination and hard work. Ward won three New England Golden Gloves titles as an amateur before turning pro in 1985. He started off 14-0 in his professional career. Ward was known for his devastating left hook to the body and his ability to withstand punishment while waiting to land his trademark shot. A perennial underdog, he has been known to suddenly drop his opponent in the late rounds with a single shot to the body as he did against Emanuel Burton. After a 15-year pro career, the veteran Ward gained widespread fame in his May 18, 2002 fight with Arturo Gatti, broadcast live on HBO. In 2001, Ward´s battle with Emanuel Burton on July 13 had been named the Ring Magazine Fight of the Year and it served to set up the much-anticipated Ward-Gatti matchup. Ward-Gatti I saw both fighters withstand an amazing amount of punishment through 10 rounds of non-stop action. Ward, who dropped Gatti in the ninth round with a vicious left hook to the body, won the fight by majority decision.Ward-Gatti I was hailed as the “Fight of the Century” by boxing fans and writers, and Round 9 of that bout was called “The Round of the Century” by Emanuel Steward, who co-hosted the fight live on HBO. Ring Magazine named Ward-Gatti I the Fight of the Year for 2002. In their rematch, Gatti neutralized Ward´s body punching power by boxing and staying low. In the third round, Gatti knocked Ward to the canvas with a thundering overhand right which landed on Ward´s ear. Ward sprawled into the turnbuckle and stayed down for the mandatory 8 count. Nobody, especially Gatti (who after the fight called it “the hardest punch I´ve ever landed”) expected Ward to get up, never mind finish the fight. Commentators noted that if it had been any other fighter than Ward, the referee would have stopped the fight in the third round. Ward and Gatti had a third fight, on June 7, 2003. Despite dropping Gatti in round six, Ward lost by a ten round unanimous decision. Ward-Gatti 3 was named Fight of the Year for 2003 by Ring Magazine, which meant that Ward had earned that honor three times. Before his final fight with Gatti, Ward had announced his plans to retire after the fight. Micky captured both the WBU Intercontinental Light Welterweight title and the WBU Light Welterweight title. He also won the respect and admiration of many fans worldwide. The song “The Warrior´s Code” by the punk rock band Dropkick Murphys is dedicated to Micky Ward, and his photograph appears on the cover of the album. Ward´s life is chronicled in a biography by Bob Halloran entitled Irish Thunder: The Hard Life and Times of Micky Ward. Micky Ward´s trilogy with Arturo Gatti would become the cover of the video game Fight Night Round 3, on the PlayStation 2 and XBOX versions of the game.And to top it all off The movie “The Fighter” staring Mark Wahlberg as Micky Ward and Christian Bale as his half-brother, Dickie Eklund recounts Ward´s climb to fame.